Oh baby, it is COLD outside! The Dallas area, and most areas in the Mid-west, are enduring what I am unofficially calling ‘Ice-pocalypse 2011’. Around the Evil Shenanigans homestead the temperatures hovering around 15 F, while ice and gusty winds have made travel and work nearly impossible. When I get cooped up indoors during this kind of weather I tend to do some nesting. I clean, putter around the house, read, and bake. Since I am stuck at home, my driveway is a sheet of ice, I have to bake with what is on hand. A well stocked pantry is this girl’s best friend, and this time around mine was very good to me. 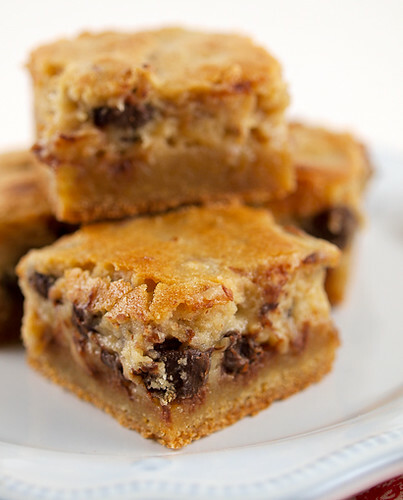 When I tell you these bars are gooey, I mean they are gooey! 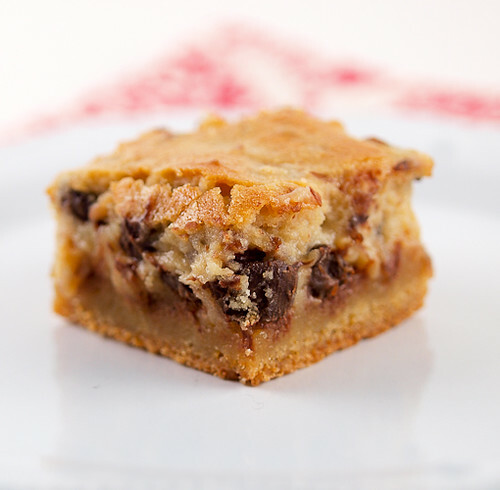 The base is buttery and moist, but the topping is soft and very … well … gooey. 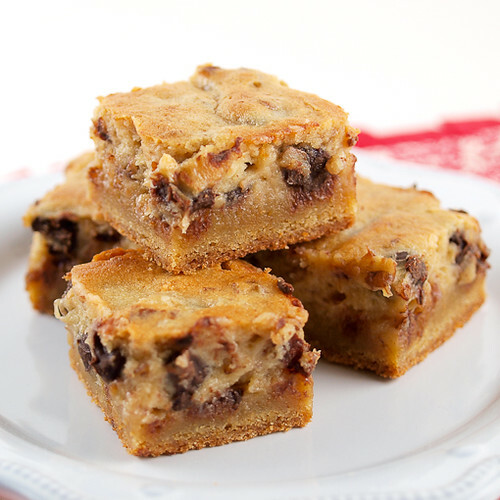 In terms of flavor, these bars taste very similar to pecan pie with a hint of cheesecake. 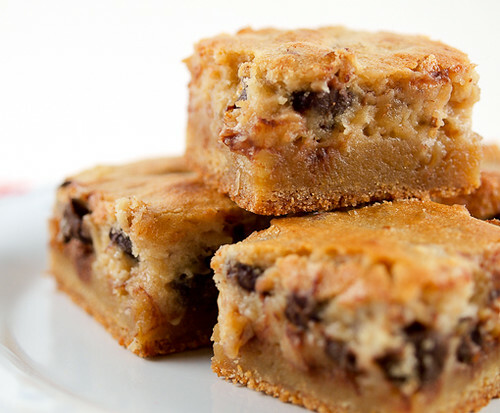 Just warm from the oven they are beyond words, and so rich you could easily have half a bar and be totally satisfied. I let these bars stand overnight in an airtight container and I think they were better. The flavors had mellowed and the bars set up nicely. You could make the base of these chocolate if you like. Just use the recipe for my Black and White Gooey Butter Cake base but cut it in half. Heat the oven to 350 F and spray an 8X8-inch pan with non-stick spray. 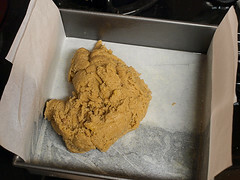 Line the pan with parchment paper, leaving two inches hanging over the sides, and spray the paper with non-stick spray. 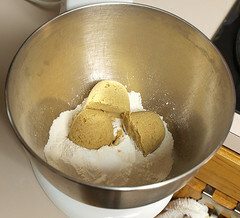 In a medium bowl whisk together the flour, baking powder, baking soda, salt, and brown sugar until well blended. 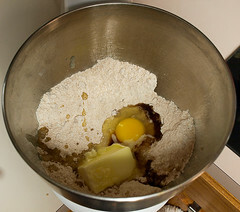 Add in the butter, egg, egg yolk, and vanilla and mix until smooth. 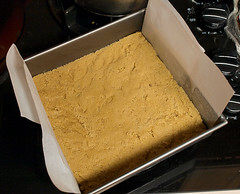 Turn the batter out into the pan and press it evenly into the pan. It will be quite thick. 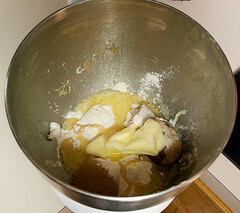 In the same bowl beat together the cream cheese, corn syrup, vanilla, butter, brown sugar, salt, egg, and flour until smooth and lighter in color. 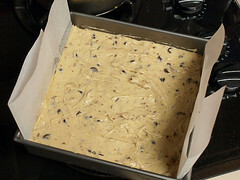 Fold in the pecans and chocolate chips. 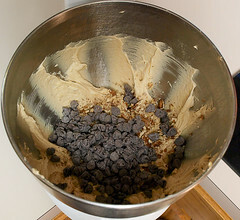 Carefully spread the topping over the base and bake for 35 to 40 minutes, or until the filling is puffed and the edges are set, but the center is just a little wobbly. Cool completely in the pan. 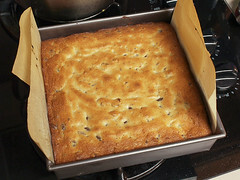 Use the parchment to remove the bars from the pan and slice.